Another award show is all set to take place this weekend. The 64th Filmfare Award ceremony will take place tomorrow night and considering how big they are in the industry, everyone from Bollywood is expected to turn up at the event. Stars have already started prepping for the gala and these BTS videos are a proof of the same. 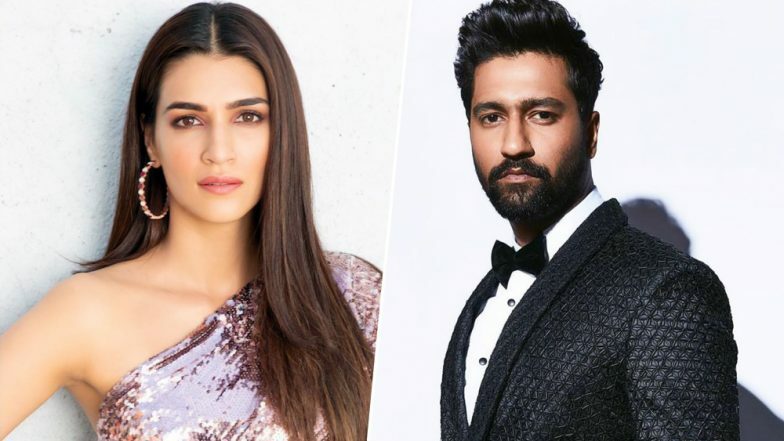 Yesterday, despite it being Holi, Vicky Kaushal and Kriti Sanon managed to take time out for rehearsals. Vicky, who is riding high on the success of his last film - Uri: The Surgical Strike, will be seen paying a tribute to Amitabh Bachchan with his performance at the Filmfare Awards 2019. Kriti too was spotted prepping for a dance performance and we're expecting it to be a dhamakedar one! While we don't know which songs have they chosen to shake a leg on, we sure do know that they're both pretty excited to be a part of it. Has Vicky Kaushal Become too Big For His Shoes After the Success of Uri: The Surgical Strike? Here are three reasons why @vickykaushal09 is looking forward to his first performance at the #VimalFilmfareAwards 2019. The beautiful @kritisanon is prepping up hard to get the crowds grooving at the 64th #VimalFilmfareAwards 2019. It is sure going to be a glamorous affair tomorrow with the who's who of B-Town attending the Filmfare awards. As much as we are excited to see our favourite stars perform, we're also awaiting the winners list! How about you? Who do you think will win big at the Vimal Filmfare Awards 2019? Comment below and tell us!